I tried something completely different, but Rusty didn’t love it (even when I suggested that we use rainbow colors to make it more exciting – maybe I should have suggested adding kittens!). 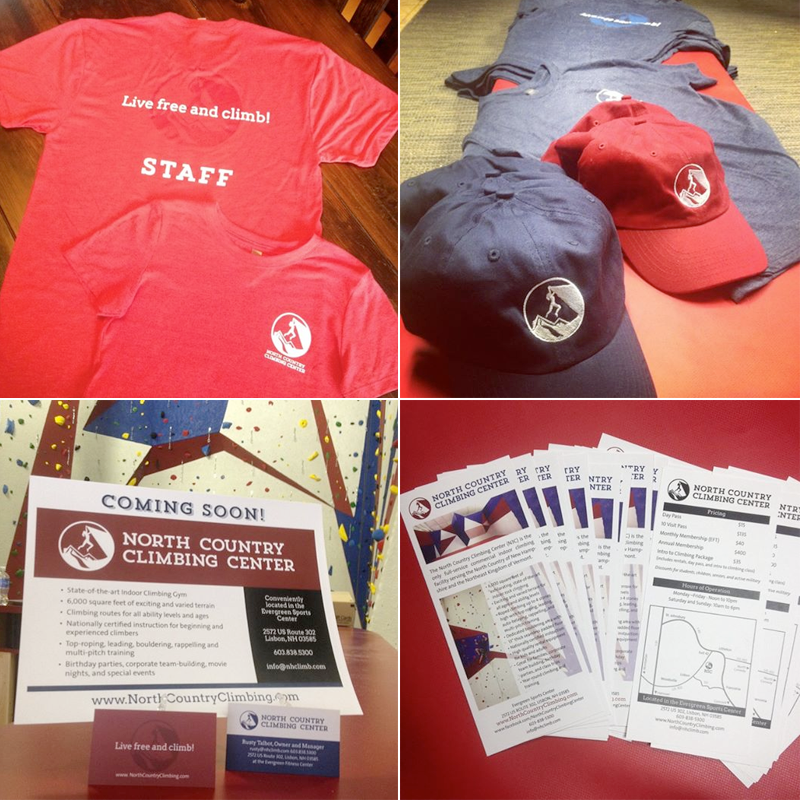 Then it was time to pull together the files for the t-shirts, sign, fliers, and all that good stuff. The snowy mountains and the trees. 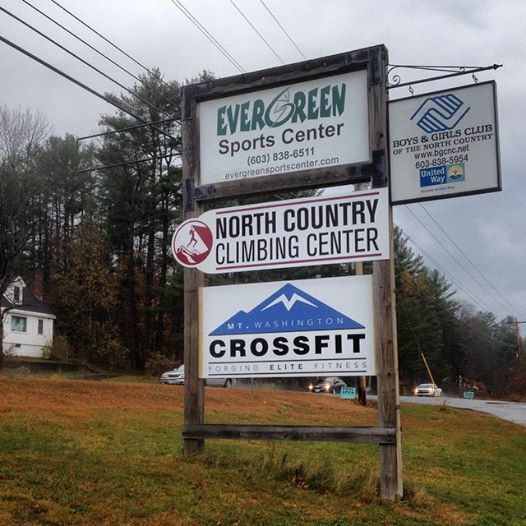 If you look closely you’ll even see a version of the NH state symbol – the “old man of the mountain” that was part of a local cliff until it collapsed in 2003 (it’s still the state symbol even though it doesn’t exist in nature anymore, however!). The other side of the mountain that has the old man on it has a ski area, so we represented that with the little ski slope curving down the mountain on the right. 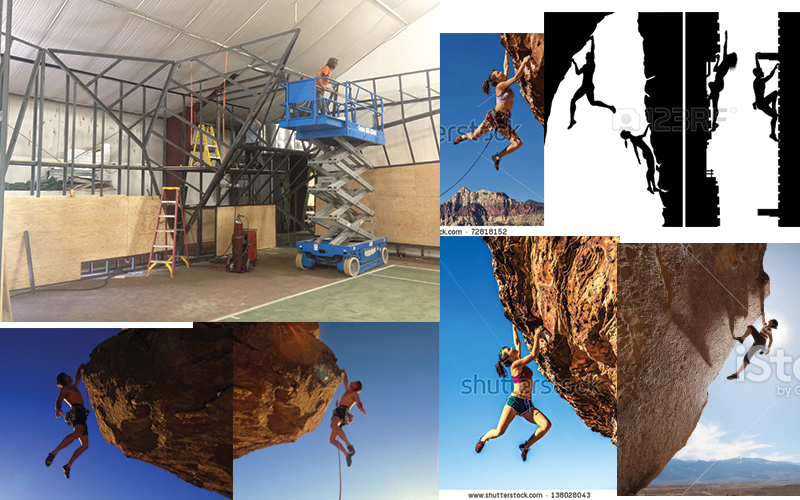 Please note that I’m not that attached to the climber or his/her body position. It’s not as crisp as I think I’d like it to ideally look. We toyed with different shapes and sort of honed in on a circular design. 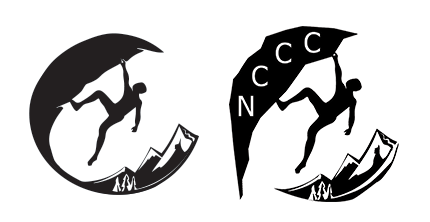 The shape of the cliff in the larger file was sort of blah so we were moving toward a cleaner circle-style. She hadn’t gotten around to cleaning up the cliff to make it flow smoothly into the circle, however. 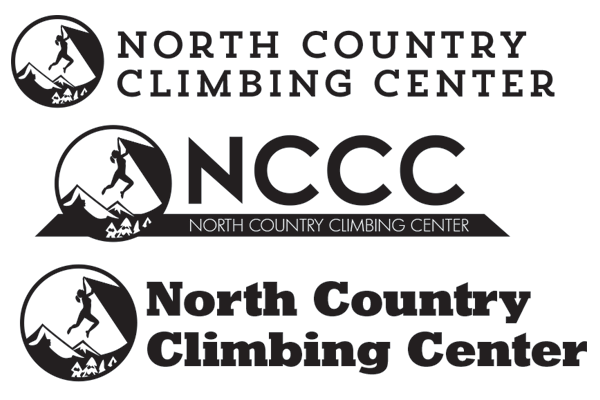 I think that I’ll just want to have the words “North Country Climbing Center” next to the logo or below it or not all depending on the context. The walls are going to be a mix of deep blue, brick red, and off white (it’ll actually be light granite). We need to be careful to keep this from looking like an American flag, however! 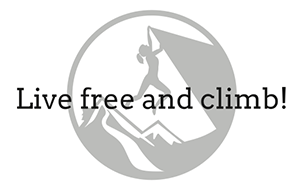 Note that I’m using the catch-phrase of “live free and climb” (a play on the NH motto of “live free or die”). Thank you so much for being willing to assist with this. 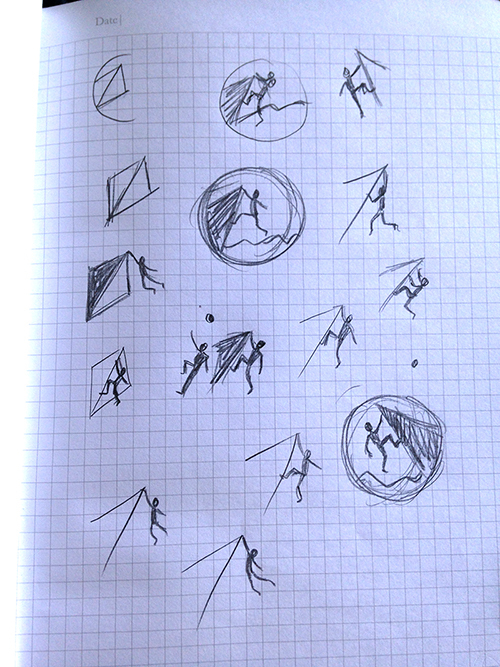 While I do like the direction [former designer] was going in, I’m totally open to your awesome creative ideas. 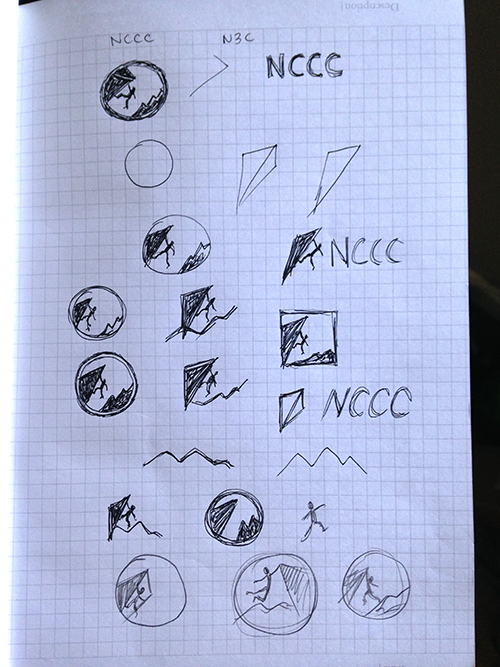 Rusty was detailed and organized in sharing his thoughts about the existing logo design and what he wanted. Bulleted lists are always helpful to break things down! 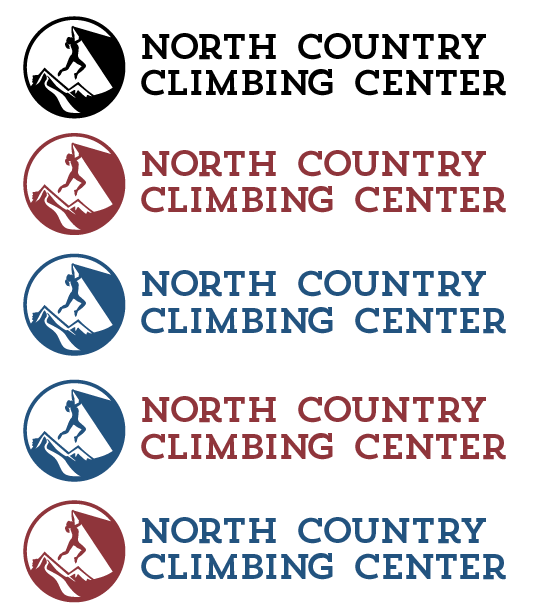 Rusty gave me some bigger picture branding requirements, explaining his desire to integrate “New Hampshire” and “rock climbing” into the logo. And of course, he implied that my ideas would be “awesome” and “creative.” Flattery never hurts! 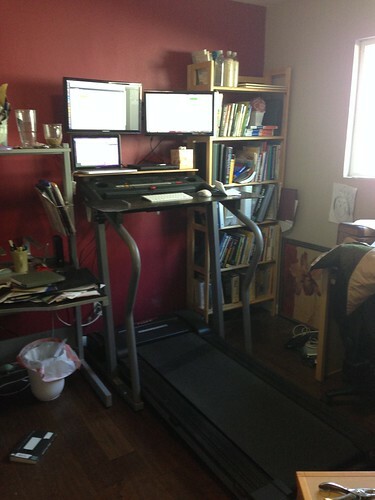 I’ve been wanting a treadmill desk since 2005, when I first read about James Levine putting one together. 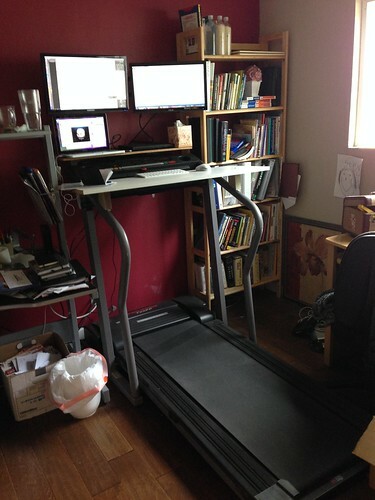 Steve and I are not quite as penurious as we used to be in 2005, and it was reading this blog post by Ann Marie Michaels where she credited much of her increased activity to her treadmill desk that I decided to bite the bullet. 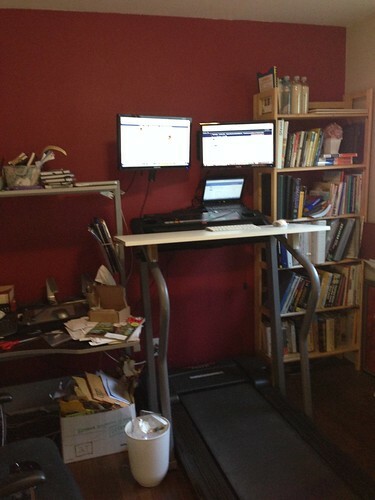 I also pinned a number of DIY treadmill desks to a new Pinterest board. 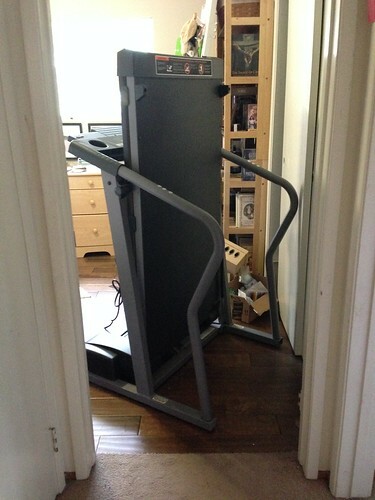 That very weekend, I went on Craigslist, and lo and behold, there was a $180 treadmill for sale literally around the corner from our home. And we even had our friends’ truck in the driveway after a car-trade-for-a-day sort of thing. Perfect! In a matter of hours, we were owners of a Pro-Form 725 FP. It seemed massive. We had a random piece of white melamine shelving in the garage. 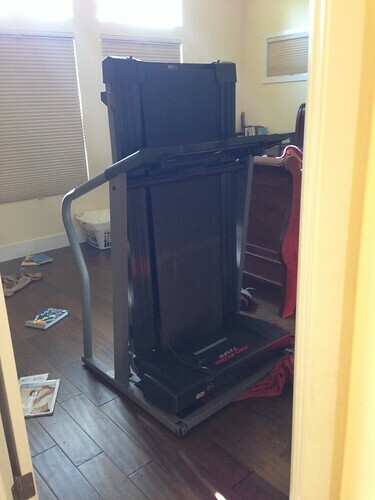 I had Steve hold it against the treadmill. 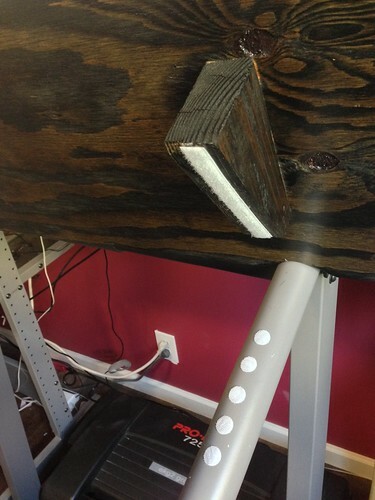 Pushed up against the top edge of the angled handlebars, it was a good height for a keyboard. 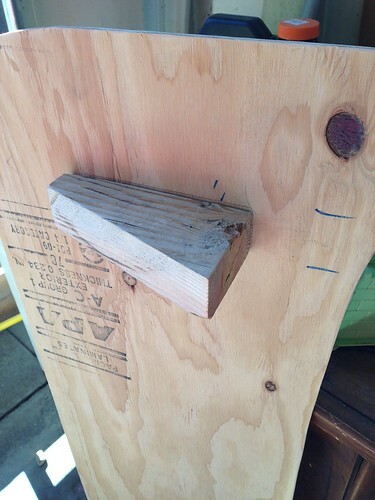 I took some scrap 2×4 and drew a rough angle for a cut. 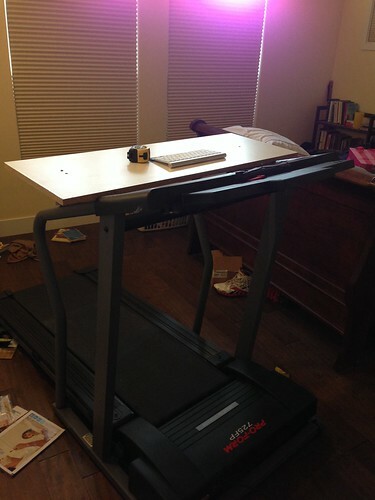 With two screws on each side, I now had my Treadmill Desk Beta. The screws weren’t countersunk so they stuck up a little bit, but they were far enough out that it didn’t bother me. 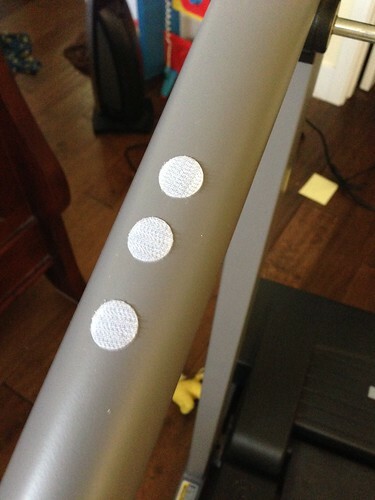 To attach the supports, I used Velcro dots and strips that we already had on hand. But where I really wanted it was in the office! Naturally, I picked a time when Steve was not at home to help me. 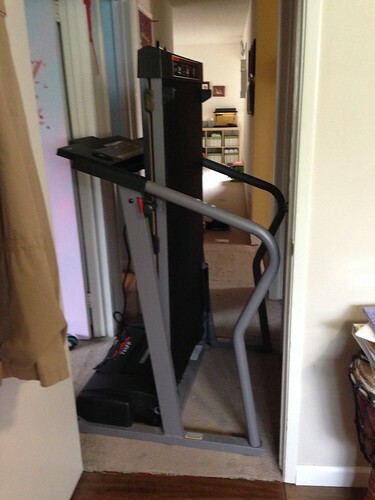 I managed to scrape the floor nicely as I shoved the treadmill down the hallway. 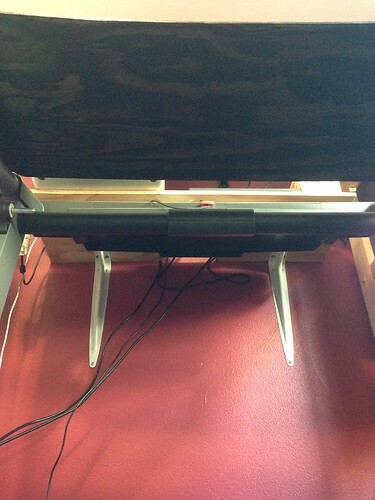 Then I wrestled the treadmill across the short span of carpet. And then I was stuck. 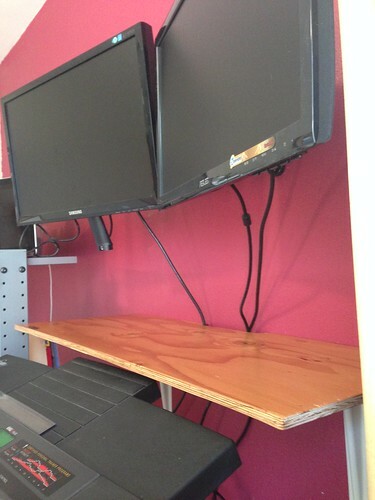 Then I moved it into the place where my filing cabinet, with printer on top, used to be. 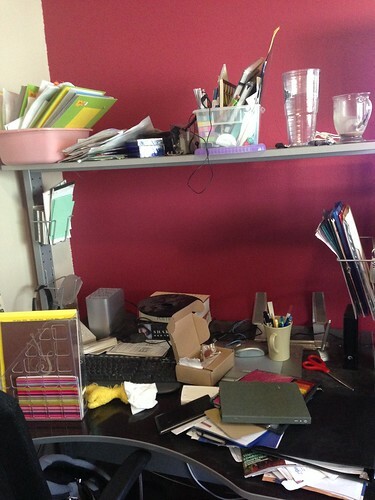 The file cabinet was now in the middle of the room (you can see it in the picture below). 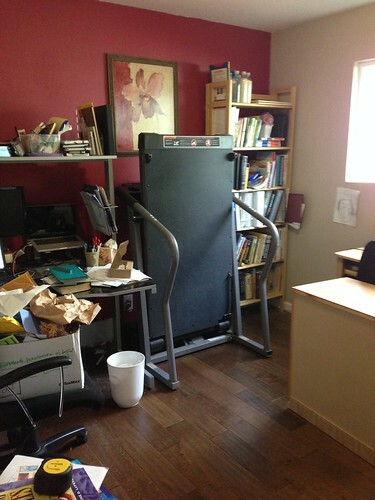 The printer got moved to our new upright file cabinet in the other corner of the room. Luckily, it’s a wireless printer, so location wasn’t important. 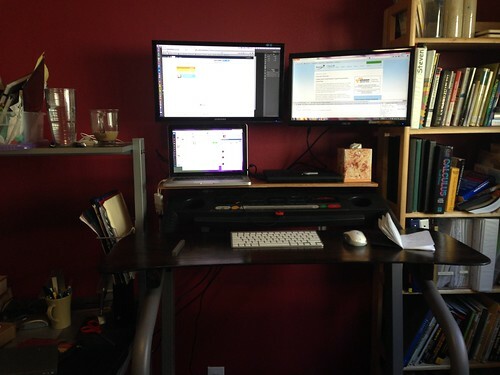 I took it on a test run, moving my work-issued laptop and setting the keyboard into the built-in book holder. 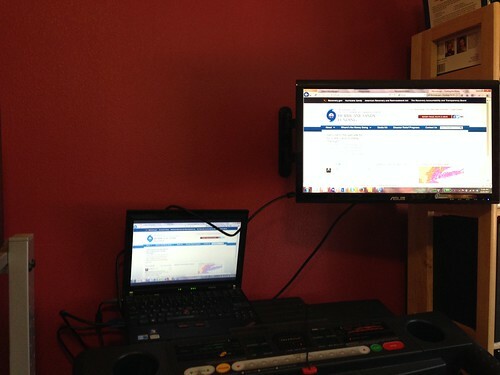 I configured my Bluetooth mouse and keyboard and successfully walked and worked for the first time! 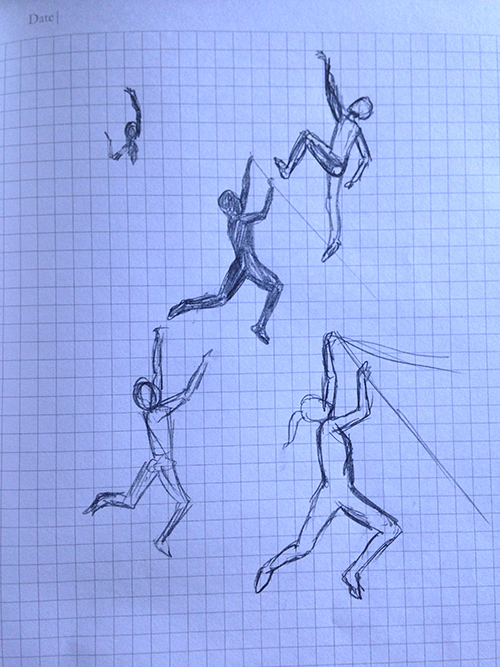 I did this for a couple of days — using my Mac at my desk for most of my work, and moving to the treadmill when I had to do stuff on the PC. Things got serious when my Amazon order arrived. 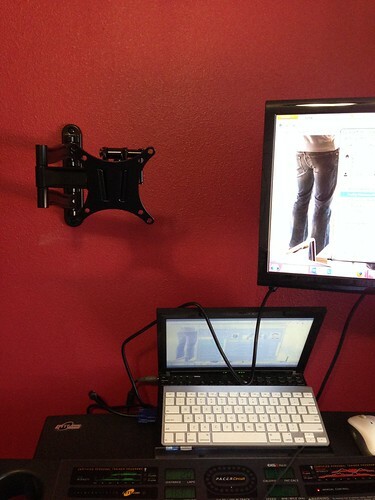 I purchased two articulating wall mounts ($22.99 each) and a second monitor (20-inch, $99.99). My other monitor is 22 inches, and I approximated that I would have about that much room to work with if I put them up side-by-side. 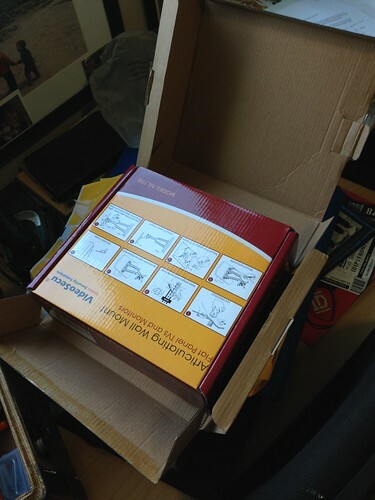 The wall mounts arrived – a box inside a box inside a larger box. Really, Amazon? 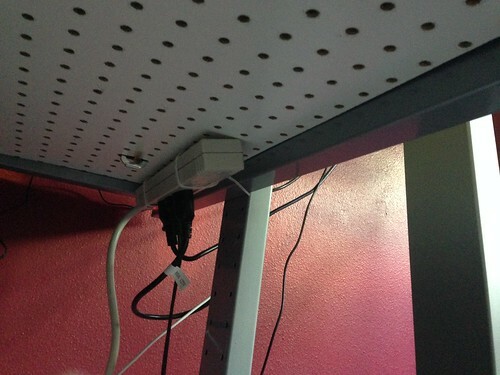 I had to install a new surge protector onto the bottom of my declutered desk’s pegboard so that cords would properly reach. 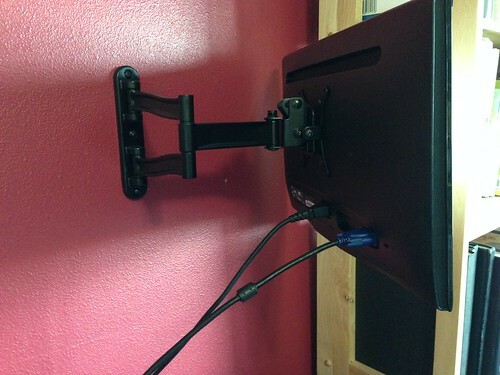 Then, I put up the first wall mount and mounted the new monitor. 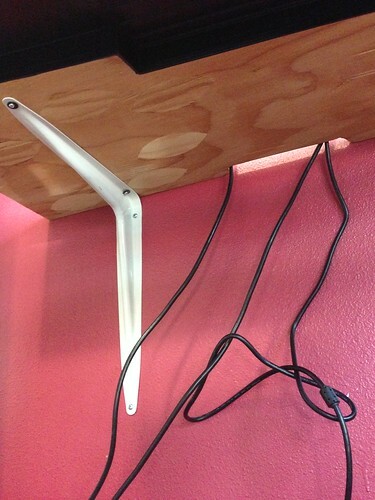 … leaving room for the second wall mount. 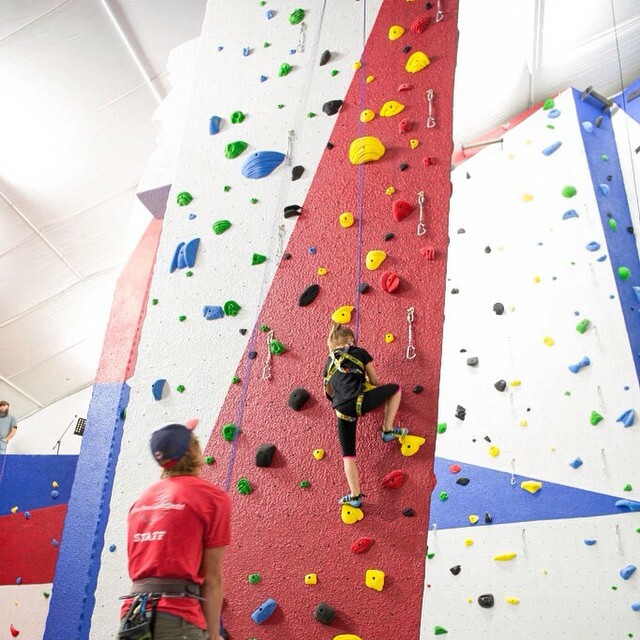 I needed Steve’s help to strong-arm the bolts all the way into the wall for this one! Second monitor mounted and connected! 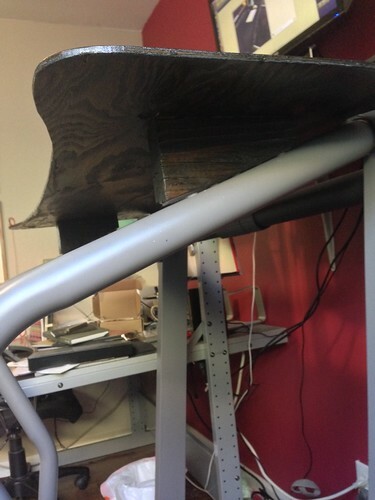 Although I was rather annoyed that the insert-and-click post of the monitor stand is not designed to be removed, short of taking a hacksaw to it. Thank you, Samsung. For now, I put my Mac on the top shelf of my Ikea Jerker desk (another Craigslist find from a while ago) so that the monitor cord would reach. That was all well and good, but I’m guessing it’s not great for a laptop to be continuously jostled by the movement of someone walking on a treadmill. So, using some half-inch plywood that we already had on hand, and using some shelf brackets we already had as well, I made a shelf. 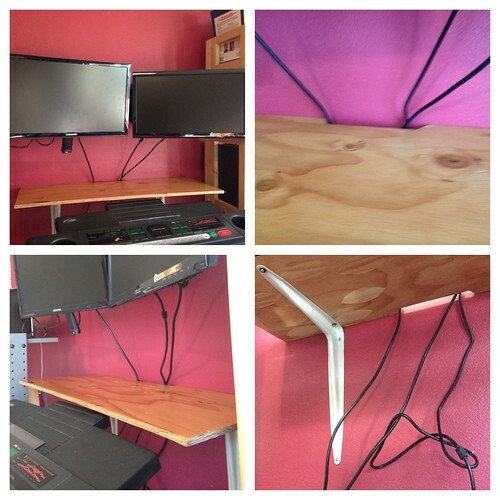 The shelf has a little slot cut out in the back so that cords can go through… and you can see the Very Basic Shelf Brackets that I’m using. I covered the shelf with a few coats of polyurethane, leaving it the natural color of the plywood (with a slight “ambering” effect). 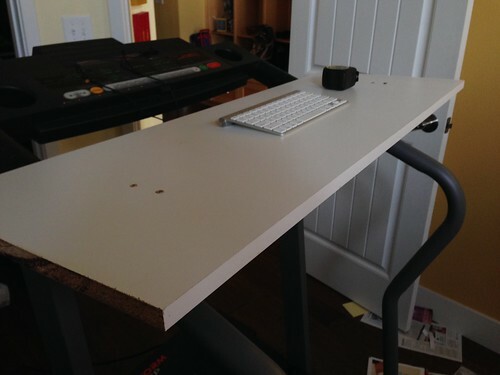 The shelf was also positioned with about a half-inch of clearance to the very top point of the treadmill, to provide as much room as possible for my Mac laptop screen to open underneath. 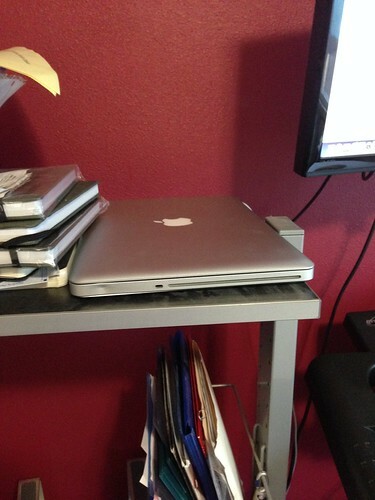 Because this is what I wanted: Mac laptop open on the shelf with external monitor above, and PC external monitor above. 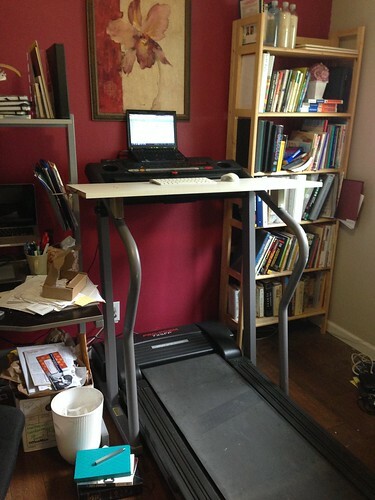 After working on this setup for a week or so, I was ready to make the final version of a treadmill desk. I was envisioning something with natural-looking wood, matching the shelf, but with friendly curves instead of hard corners. 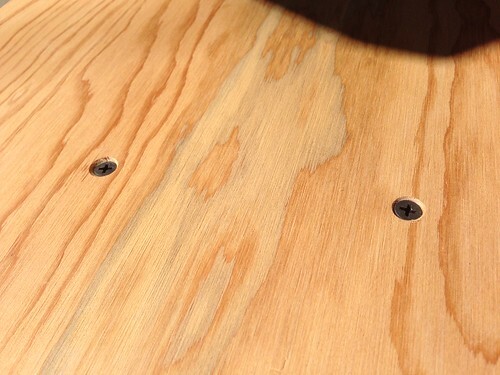 I had some quarter-inch plywood in the garage, just enough, in fact, for my new desk, so I cut it to shape with a jigsaw and countersunk the screws. I made the bottom supports longer – and spent a lot of time with Steve patiently holding the board with a level on top of it so that I could get the angle just right. I filled up the screw holes with wood filler and put on a coat of polyurethane but then realized the wood filler didn’t pick up the “ambering” effect AT ALL. They stood out visually like sore thumbs. (No picture.) So I ended up sanding the whole thing off and using Minwax Ebony stain (had it on hand in the garage from the treasure chest we made a long time ago). I applied the stain twice, letting it soak in for 15 minutes the first time and 2 hours the second time (I forgot about it!). 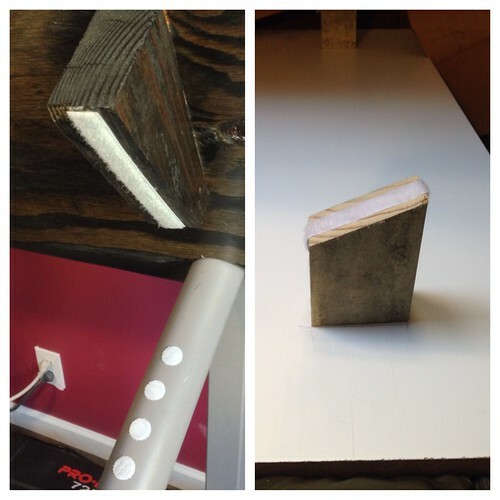 Then I applied two coats of polyurethane to the top and one to the bottom (getting impatient!). The dark brown actually blends nicely with our dark wood floors. 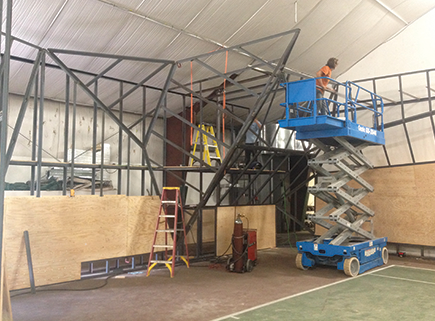 Here’s a picture of the supporting pieces underneath. I wasn’t initially going to stain underneath until I realized that you could see the side supports, and now I’m glad I did the whole thing. Because of the longer supports, I added on a few more Velcro dots. 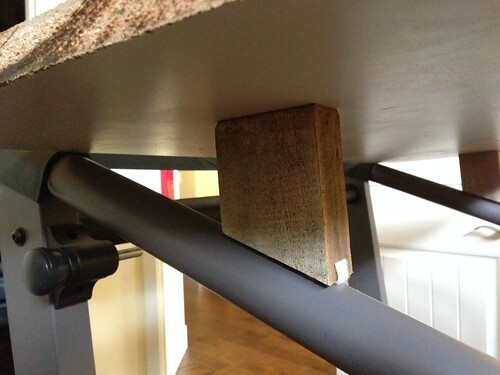 The desk feels much more secure now – before if I leaned on the front part of it, it would start to tip off. 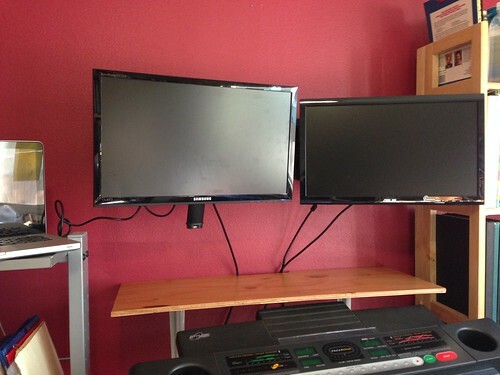 Everything is the same as before – Two mounted monitors, Mac open, PC closed, and box of Kleenex at the ready. I put my water glass and coffee on the top shelf of the desk so it’s easy to reach. 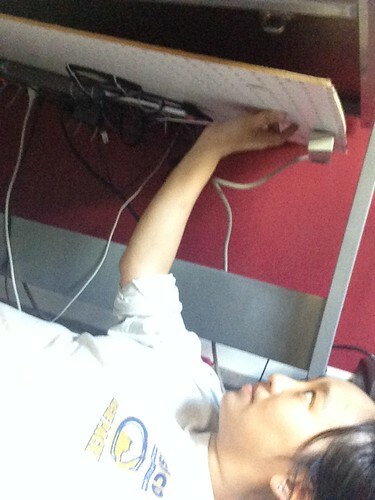 I use a Mac wireless keyboard. I miss my extended keyboard that I used at my desk (but it’s wired), so I may eventually get a full wireless keyboard. 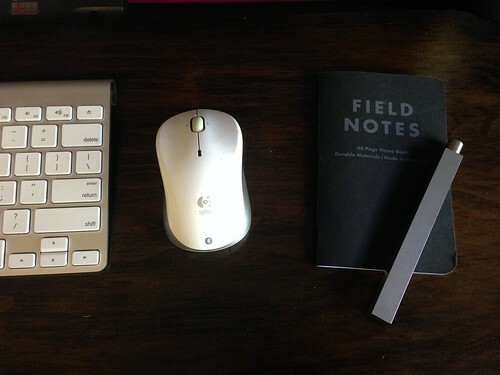 Oh why doesn’t Apple make a full wireless keyboard…? I love the feel of the wireless one – it’s so narrow and polished. Then, I use my Logitech Bluetooth mouse. I got this a while ago, although I have a functioning Wacom Intuos 2 Tablet/Stylus/Mouse, because when I started using Synergy to share my keyboard and mouse between my Mac and PC, the Wacom didn’t work with Synergy. Now that I’m doing all my work on the treadmill desk, and facing the reality that I haven’t used my Wacom hardly at all except for some minor drawing in Illustrator and to sign my name on PDFs, I’m cutting the ties and getting rid of it. One side note is that I moved my Mac Dock from the bottom to the left side. Because I had my external monitor arranged above my laptop, the dock ended up on the smaller screen at the very bottom. SUPER annoying. 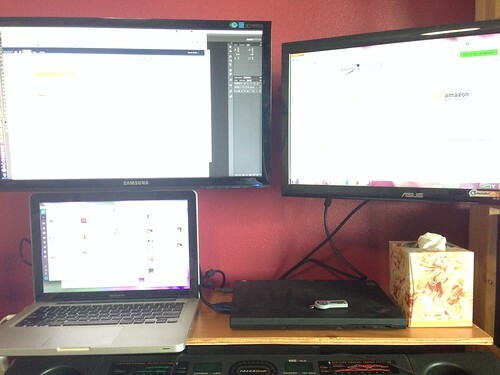 So now I’m getting used to having the dock on the left side of the big monitor. And just how is the walking-while-I-work thing going, you ask? I find it VERY hard to make it the full 10,000 steps on the days I don’t work! My speed is usually set to 1.8 mph (I started at 1.5 mph and worked my way up). It’s a moderate pace. 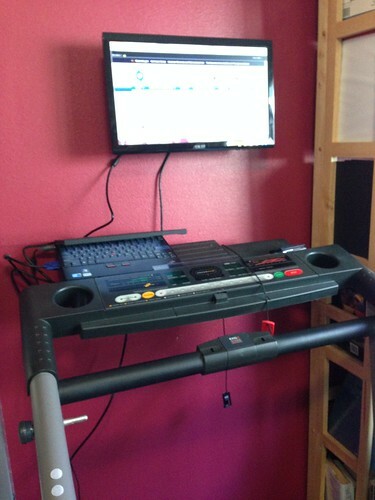 I’m well able to type and use my mouse while I walk, but the treadmill is noisy enough that I have to turn it off for meetings. So on the days that I have a lot of phone calls, I walk a little less. I can usually get 5-7 miles a day. With small kids in the house, I find that I get enough breaks from walking and have a hard-stop with work hours as it is so I haven’t missed sitting down too much. But I could definitely see having to figure out a sitting solution if I worked longer hours. 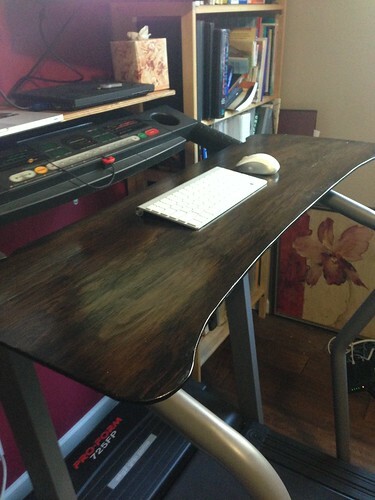 I can’t imagine a bar stool on a treadmill, even stationery, would be a good idea! 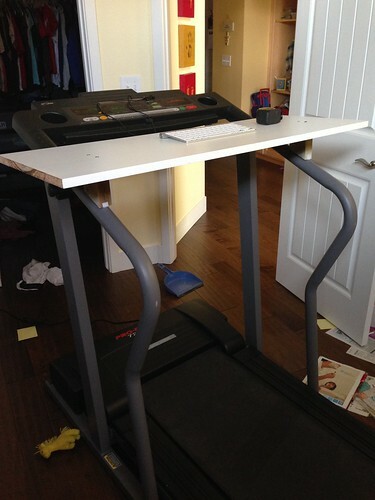 That’s that for my treadmill desk! Now I just have to clean up the rest of the office. Especially my desk. I have a list with an Image column. When adding items to the list, you get the ability to type a description for the image. Seems like this would be used as “alt” descriptive text, right? Well, let’s pull this field into a Content Query Web Part. I’ll use the default of “image on left” just to see what happens. In the Fields to display section, I put in my “Image” column name, as shown below. I’m hoping that the image will be displayed on the page, and that my image description will show up as “alt” or “title” attributes. But nothing shows up! When I view the HTML, there is no “alt” attribute, and the “title” attribute is blank. For some reason, the @ImageUrlAltText just isn’t showing up. 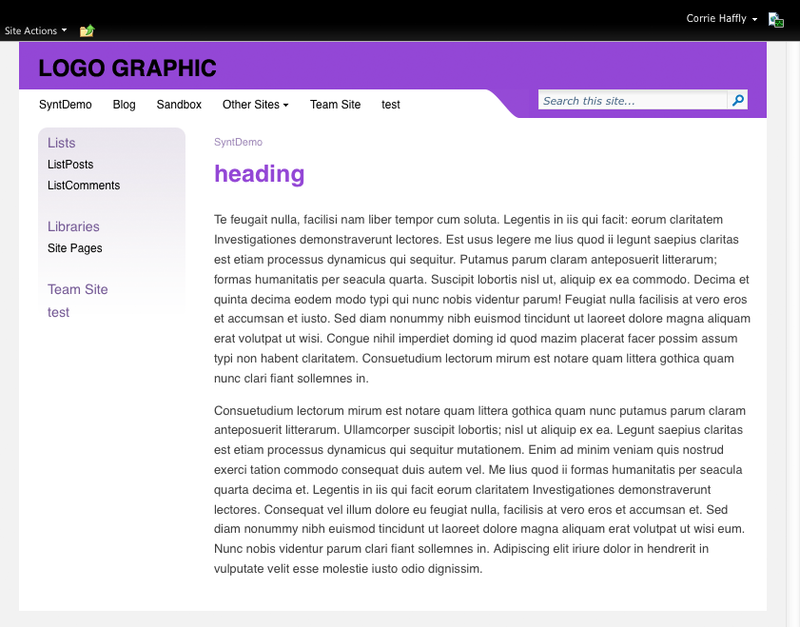 Rather than fight with SharePoint to figure out why, let’s create our own custom Item Style. You can keep this as the “title” attribute, or change it to “alt,” depending on what you want. Save ItemStyle.xsl and check it in. (You have check in ItemStyle.xsl or else the changes won’t show up.) In your CQWP, change the item style dropdown to your new custom style. If all has gone well, you should see your image pulled in with the proper image description as your title (or alt) text! With our oldest in preschool (already! ), we get to have our first experience with classroom Valentine’s Day cards as parents. I took Steven to Target and he decided on Fun Dip for his nut-free classroom treat, but when I pointed out the variety of cards, he slumped his shoulders, heaved a big sigh, and said, “Ughhhh – I can’t deyide! There are too many choices!” I asked if he’d like to make his own cards at home, and his face brightened up. Fine by me! In Photoshop, I cut out the various pieces and used the Levels command to make them cleaner. Setting the scanned layers to the “Multiply” mode so that colors would show through, I used the pen tool to draw solid-colored shapes underneath the layers. Below is a faux 3D layered version of what I put together. 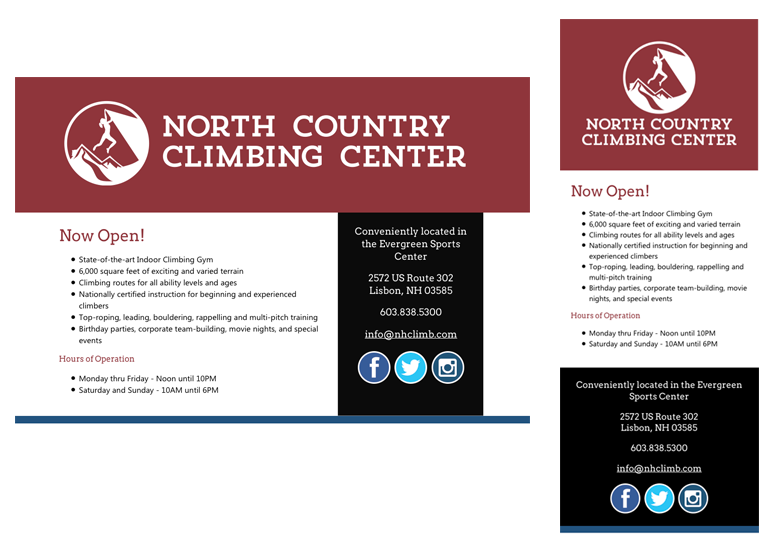 The final graphic was sized to fit a quarter-sheet. I printed out four on a page, cut them apart, and Steven wrote his classmates’ names inside the heart. We dropped these facing forward in a vellum envelope (of which I have plenty on hand), tucking the Fun Dip packets behind them. Once you understand how theme colors work in SharePoint 2010, you’re on your way to creating your own themable (or “themeable”) master pages! This article is not going to go through the details of making your own master page, as there are plenty of resources on creating custom master pages in SharePoint 2010. Instead, I’ll cover what you need to know to successfully create a themable master page. 1. Ensure graphics can be recolored appropriately. The top header area has a wrapper div with an orange background color (#ffbe18). 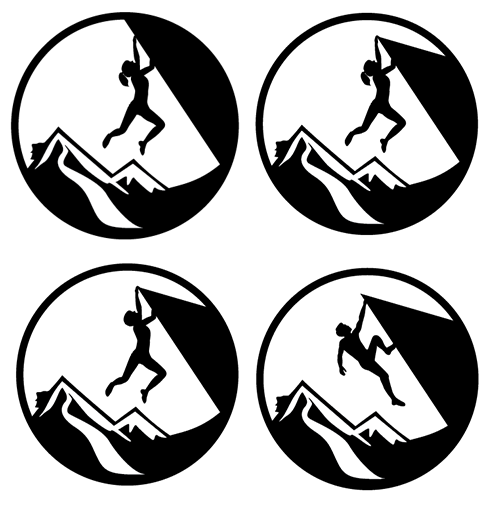 Inside the wrapper div, my menu div uses a white background color, but I have a transparent background PNG called “navtab.png,” positioned on the right side of the div so that there is a curved tab effect. When a new theme is applied, SharePoint’s theming engine can recolor everything. The wrapper div’s background color can change (orange to green), the menu div’s background color can change (white to beige), and the non-transparent pixels in the graphic are recolored from orange to green as well. 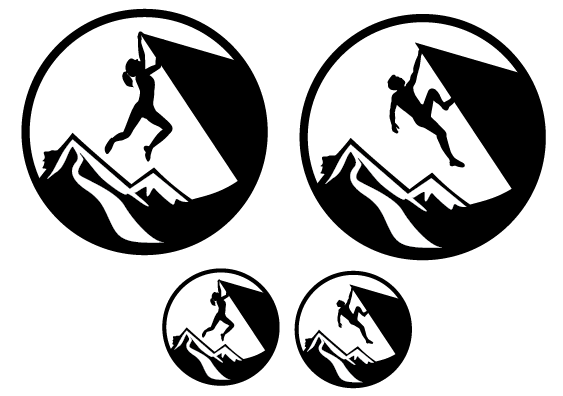 By the way – any graphics that you want to be recolored must be in PNG format. 2. Set up your CSS without shorthand notations for colors and backgrounds. Now, add in theme comments — that is, theme “tokens.” You can replace colors (font colors, background colors, border colors) with the ReplaceColor token. You can get even more variations by using the themeShade (darkening) or themeTint (lightening) properties, if one of the previous “Lightest… Darkest” shortcut properties don’t work for you. You can also recolor just a portion of an image by specifying a rectangular area with the “includeRectangle” property. The x and y values determine the upper left point of the rectangle, and then you specify the width and height of the rectangle to recolor. 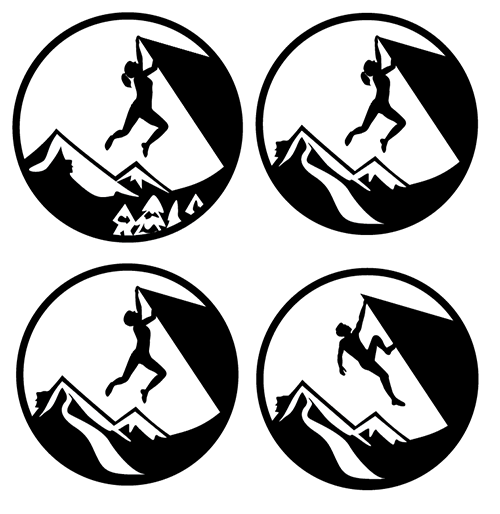 Note that if you refer to the image multiple times in the CSS, the last reference to the image is what it will look like. The theming engine only creates one recolored version of the image, so it will choose whichever definition overrides the others. Your CSS (and image) files should go in the top level of your site collection into either /Style Library/Themable or /Style Library/~language-code/Themable (such as /Style Library/en-us/Themable). 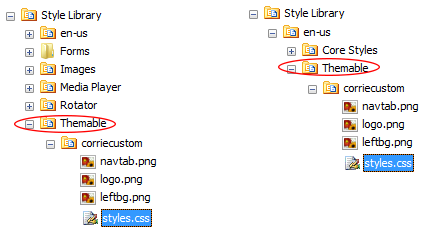 The Themable folder is created automatically for publishing sites; if you don’t see it in the Style Library folder, you can just create your own folder. Just be sure to spell it properly! You can then drop in your styles and images into those folders, or into a subfolder if, like me, you want things to be somewhat organized. I tend to refresh often as I’m working on a custom master page design. If you’re trying to see how your themable changes affect your design, be sure to check in and publish your stylesheet and images. 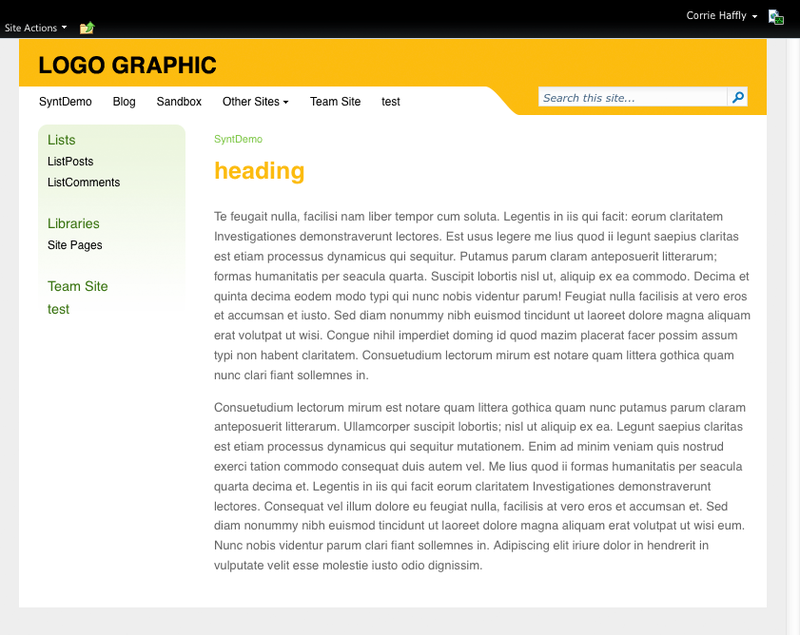 You will then need to apply a new theme so that SharePoint regenerates the themed files. Then, you’ll be able to see your changes! Below, you can see my site with my custom master page applied, after switching themes a few times! Working with the SharePoint Theming Engine – This SharePoint team blog post was invaluable in helping me understand how the theme color variations worked.